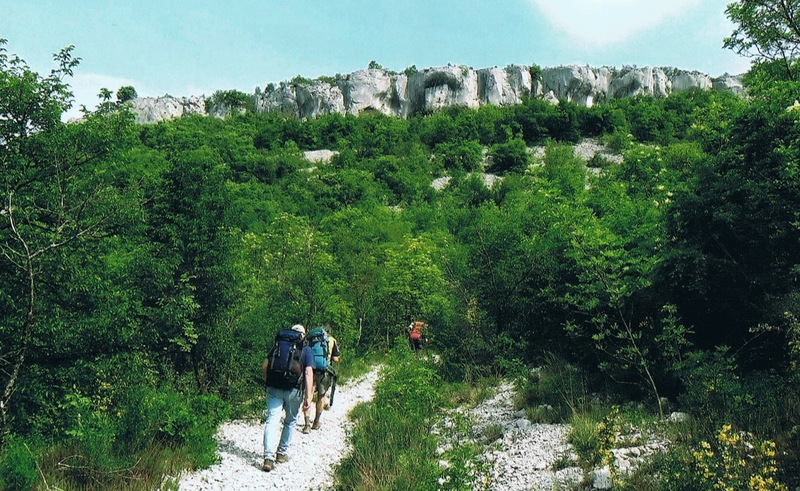 A six day hiking trail on the Istria-peninsula, through the Croatian and Slovenian border. Although the (west-) coast is considered as the most popular destination for foreign visitors, for walkers the mainly unspoiled and quiet inlands are more worthwhile. Getting there: a flight to Trieste (Italy), the bus to the central bus-station of Trieste (1 hour), by bus - through the Slovenian spit - to Buje ( Croatia, 75 minutes) and you can start the trail. Maps: we used the Kompass-map for walkers and cyclists, nr. 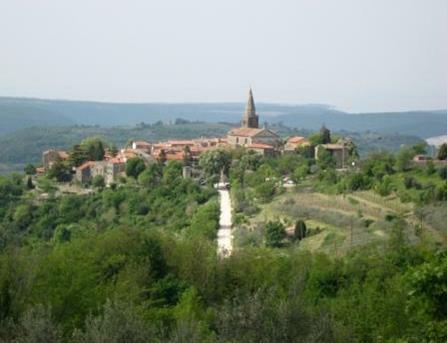 238, Istria, scale 1:75.000. Ask on spot for maps of local routes which are more detailed. 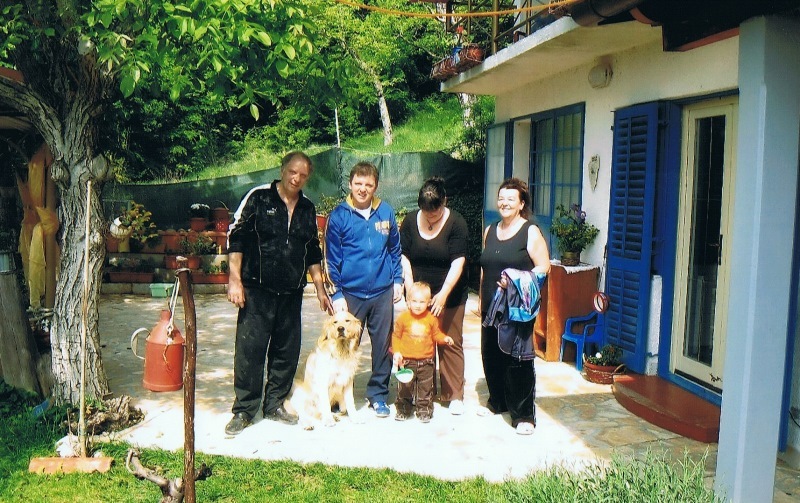 Accommodation: “agroturizam” ( say: stay at a farm), “sobe”( say: Bed and Breakfast) or apartments. It is advisable to prepare your stay for the night. Many villages on the trail don’t have the accommodation. Or: check at your stay the possibilities for the next day. 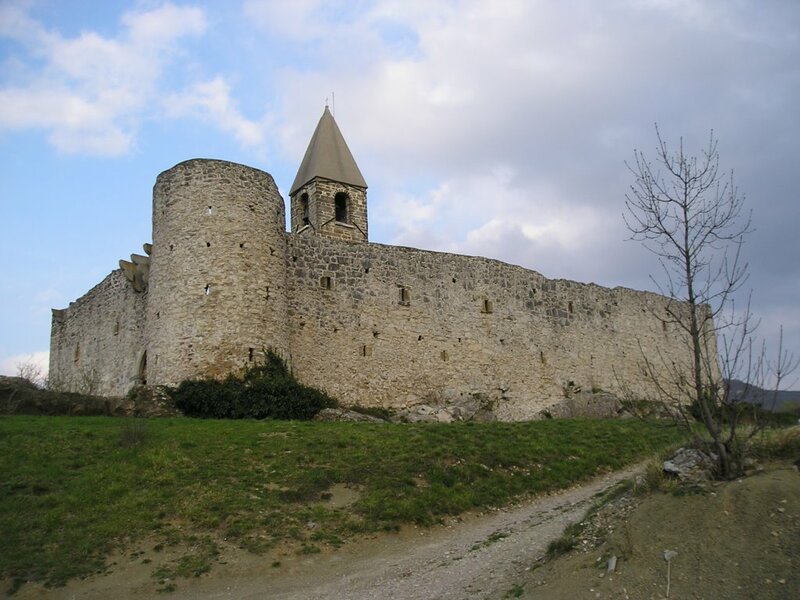 April 2011: six trails through a scenery that can be compared with Tuscany: hills up to 500 meters, the typical Istrian villages on top, the remains of the different rulers, the olive groves and vineyards, pine forests and absolute great panorama’s. Day 1: Buje (bus station) - Momjan......8 km. Day 2: Transport to Grožnjan. Day 3: Buzet - Crnica* - Gračišče (S)....25 km. 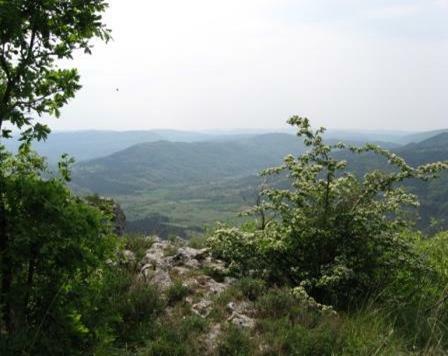 Day 4: Gračišče - Smarje (part of E6)....18 km. Day 5: Smarje - Krakavče - Truške.....22 km. 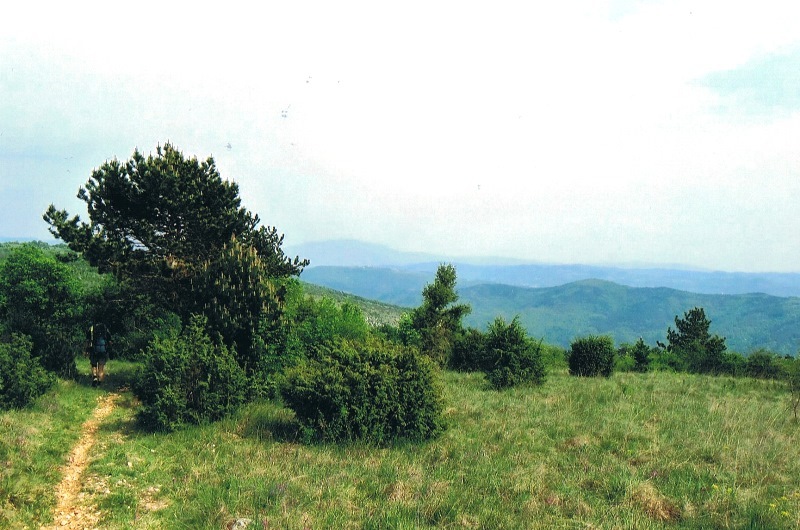 Day 6: Truške - Gračišče**....11 km. Transport to Triest (25 km.bij a local "taxi"). 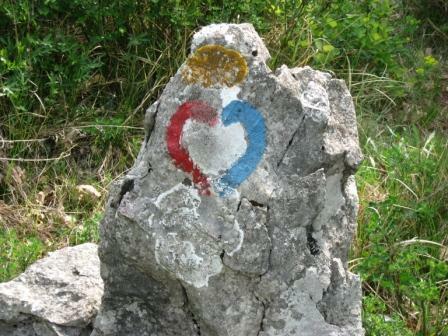 * In Crnica - near the border crossing - a great local trail starts direction Gračišče, blue-red heart marked (see: image). Ask the local people for the start. ** For those who are interested: visit the famous frescoes at the Sv. Trojika-church in Hrastovlje (a 2 hrs. 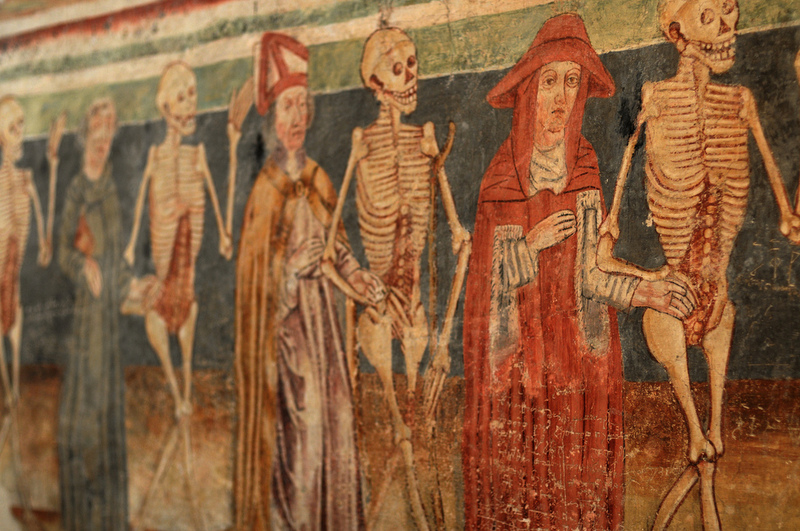 walk from Gračišče) and see the “the dance macabre”. 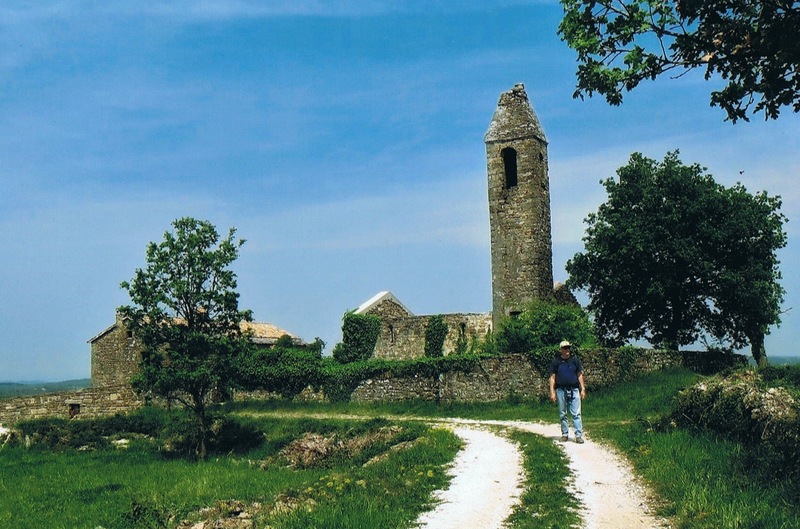 On trail: walking the local roads, sometimes asphalt, many great panorama’s, across villages in Medieval atmosphere, with their remains of former rulers, a rich flora, along the Drangonja river, Mediterranean temperatures, and: great food and drinks at your accommodation! Just try it! For a good wine and better meal: Homestead Ražman, 6272 Gračišče, Istria, Slovenia.